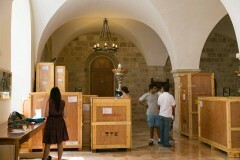 home / Multimedia / The Holy Land in videos / The Treasure of the Holy Sepulchre returns to Jerusalem after .. The Treasure of the Holy Sepulchre was featured in a three month long exhibition, which has recently come to an end, in the very special setting that is the Versailles Palace in Paris, after which all the items were returned to the Holy City. Each piece has its own story to tell… a journey back to Christianity’s roots which the Custody of the Holy Land wishes to emphasize even more thanks to the Terra Sancta Museum scheduled to be inaugurated in 2015.